It’s easy to ignore a genocide when the victims are reduced to faceless numbers. 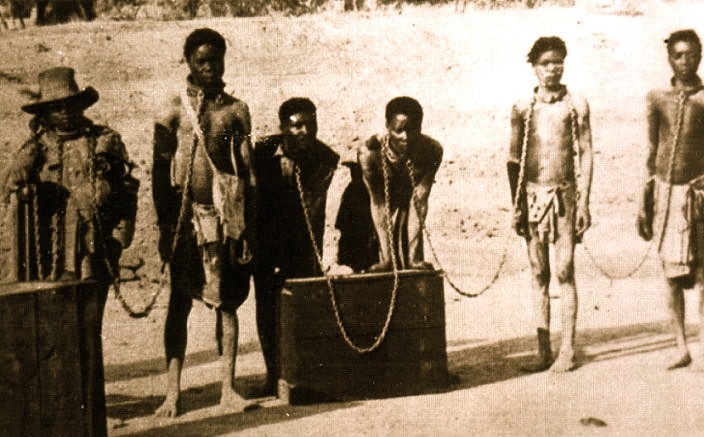 By keeping detailed ledgers that treated the victims like commodities, the German officials responsible for carrying out the 1904 extermination of the Herero and Nama in South-West Africa could blind themselves to the individuals and families they were destroying. Today, Germany and much of the world continue to ignore that genocide because they have never been forced to see the victims for who they were. That’s why it’s so important to tell the stories, to flesh out the numbers, to put a face to the horror through art, music and novels like Mama Namibia. Look at each of the people pictured above. Imagine their dreams, their thoughts, their names. Think about the ones they loved and those who loved them. Remember that they once breathed, laughed, cried, sang and danced. They’re not numbers or entries in a ledger. They are the faces of genocide.